Gordon State College is as committed to fulfilling the community's educational needs today as it was when it opened its doors more than 160 years ago. Looking at Gordon State College today, it's hard to imagine that this college, so vital to higher education in middle Georgia, began as a little schoolhouse for local children. In 1832, Josiah Holmes built a frame schoolhouse in the center of the quiet town of Barnesville so that local children could learn the classics. Twenty years later, the Georgia General Assembly incorporated the school as the Barnesville Male and Female High School. Another 20 years later, 1872, the school was renamed the Gordon Institute, in honor of General John B. Gordon, who served Georgia during three terms in the U.S. Senate and two terms as governor. 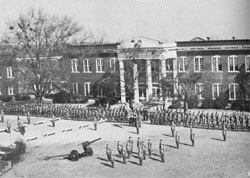 The Gordon Institute created a military department of study in 1890, and for the next 80 years, the school distinguished itself as a premier military institution. In 1933, the school - then known as Gordon High School and Junior College - moved to its current campus and Gordon flourished. It served as the public city school system for the City of Barnesville with its president serving as school superintendent of the lower grades at Gordon Grammar School, as well as president of the College. Boarding students from across the country and Central and South America attended Gordon. In the 1960s, a state commission established by Governor Carl Sanders saw a need for a junior college in middle Georgia. Through the efforts of many community leaders, Gordon became part of the University System of Georgia on July 1, 1972, with a new name: Gordon Junior College. That fall, 571 students enrolled at Gordon in its debut year as an institution of public higher education. Since Gordon joined the university system, it has undergone tremendous growth and change. Designated a state college in 2006, approximately 4,000 students attend Gordon State College, with 1,000 living on campus. The college offers bachelor's degrees in Early Childhood Education, Mathematics, Biology, English, History, BSN, Health Information Management, Human Services, Middle Grades Education and Management and Administration as well as three associate degrees. The campus now encompasses slightly more than 235 acres. There are residence halls, a house devoted to alumni affairs, a Student Center and dining hall and a state-of-the-art Nursing and Allied Health Sciences building. In 2015, the 56,000 square foot Student Recreation and Activity Center opened, and in April 2016 the campus celebrated the newly renovated Dorothy Hightower Collaborative Learning Center and Library. Gordon competes in intercollegiate sports for men and women and offers various student life activities. The Gordon State College Foundation endowment now exceeds $9.5 million. Despite the many changes, Gordon has held onto its roots. Though it is a larger school today, it still maintains its small-college feeling. Most important, Gordon State College is as committed to fulfilling the community's educational needs today as it was when it opened its doors more than 160 years ago.